The last week in June saw the first gathering of the fabulous J-Class yachts in British waters since the America’s Cup Jubilee in 2001. A fleet of four of these iconic racing machines have just been battling for supremacy in Falmouth Bay. One of these is a 1930‘s original, the others more recently-built replicas. In 2001 there were just three survivors from the golden age of gentleman’s yacht racing, but the sight of them had sparked a resurgence of interest in the class. Now, out of seven possible entrants, there only four at Falmouth. Sadly two of the yachts pulled out, depriving the world of a sight never seen even during the heyday of the 1930’s. And I was deprived of the opportunity to immortalise the sight in a very serious painting. Hanuman, a replica of Sir Tommy Sopwith’s Endeavour II, was one of the yachts which pulled out of both the Falmouth regatta and its sequel in the Solent a few weeks later. 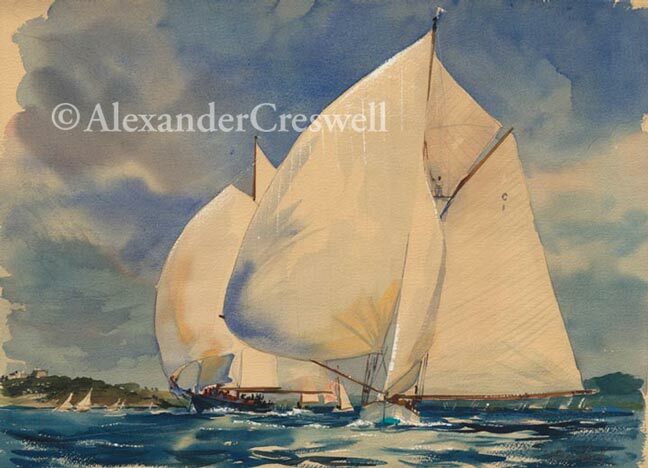 She had been launched a couple of years earlier and I had flown to Newport, Rhode Island, to witness her maiden race. It was suitable that she should be racing against Ranger, the replica of her erstwhile rival. In 1937 Ranger had won, and in Newport Hanuman won by a whisker. An historic moment indeed. 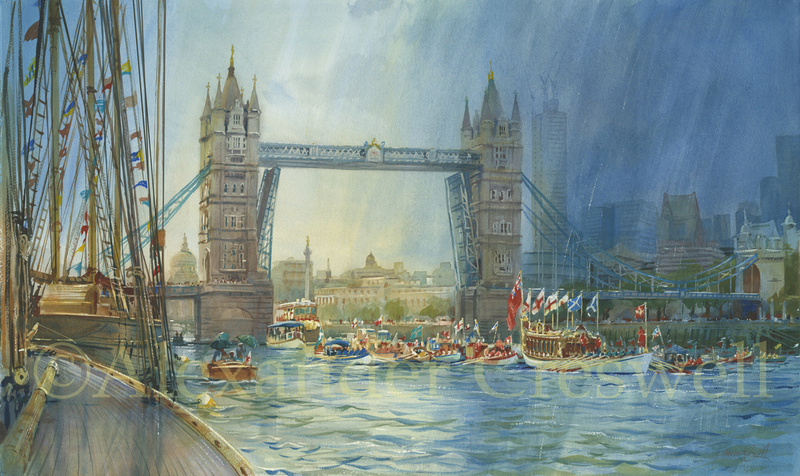 I am very conscious of my enormous privilege in painting historic events such as the Royal Wedding, The Diamond Julbilee Thames Pageant, and more recently a crowded Westminster Hall when Aung Sun Suu Kyi addressed both Houses of Parliament. In the year of the London Olympics and the Queen’s Diamond Jubilee, a great race of J-Class yachts in British waters is a triumphant celebration and a historic moment, even though only one of the yachts – Velsheda – is British built. The legacy of paintings of great events is that they form a precious permanent record. The Royal Collection, for example, demonstrates this by maintaining an ongoing tradition to commission works of art to mark great events, be they happy or sad. Paintings are not just a visual record of the facts or a pretty picture, but a representation of the spirit and the mood of the time. At best they are a portrait of the subject and through paintings the subject achieves immortality. On the canvas the moment is made legend, the fleeting made permanent and the trivial elevated. The paintbrush achieves what money alone can’t: and J-Class yacht racing is a rich man’s sport, the apogee of power, grace and beauty. Personally, I salute the owners of the J-Class yachts who raced in Falmouth and who will be racing in the Solent later this month. They are an incredibly beautiful sight, elegant and serene on the one hand, adrenalin pumping on the other. An iconic fleet racing around the Isle of Wight, across the choppy green-grey water of the English Channel – as I imagine it – the sky above scudding with clouds, raking sunlight and the occasional shower, probably. They will be sailing the same course that the original J-Class raced for the 1851 Cup which later became known as the America’s Cup – now that’s an immortal name. I shall be out there with my drawing machine, preparing for my painting, my contribution to history. I’m just sorry that Hanuman and Endeavour won’t be in the painting, nor Shamrock V or indeed a new British-built J-Class which might have been. But that’s the history book: either you’re in or you’re not. 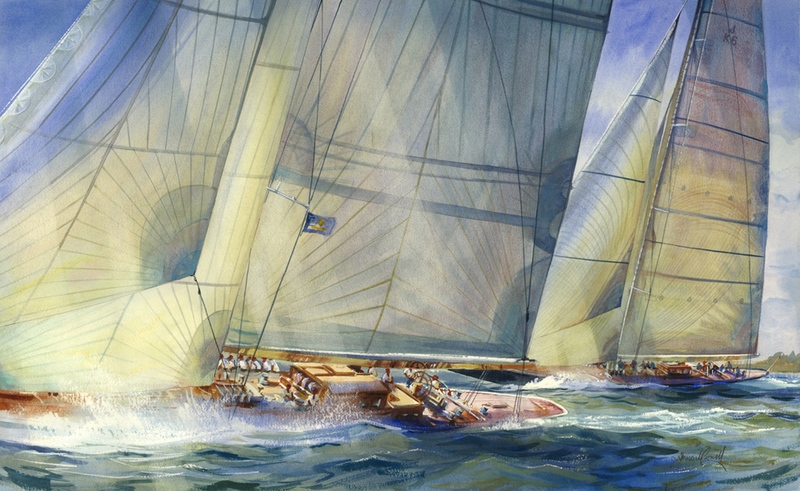 As I send out this Painting of the Month, I am setting off for Falmouth to my favourite regatta, The Pendennis Cup. The Cup this year boasts 13 great yachts battling it out, Falmouth Bay will be graced by the classics, Mariquita, Eleonora & Mariette, the jewel Mikado, thoroughbreds Tomahawk & Firebrand, plus superyachts Adela, Athos, Bare Necessities, Bequia & Breakaway, Unfurled & Velacarina. 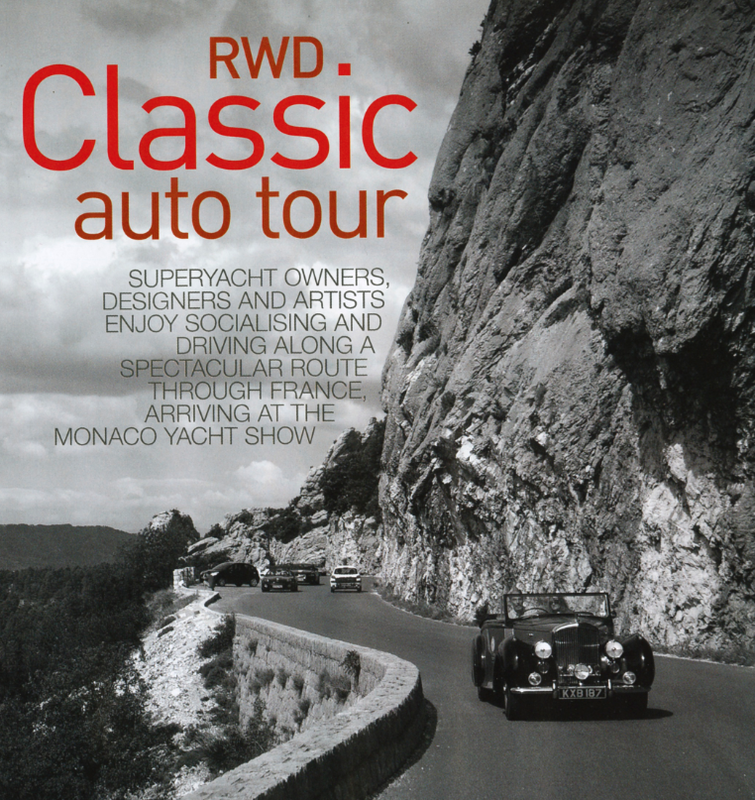 This is a fantastic event for owners, crew and spectators alike, and particularly for me! The Caribbean reagatta season begins in earnest this week, with the first gun of the St Barths Bucket on Friday 25th March. Fabulous superyachts shaking out the caution of winter for an exuberant, competitive and often dangerous melee in the azure waters of the French West Indies. For us Europeans it is a welcome relief from the long gloomy winter, even as the first tinges of colour appear in the trees back home. Elusive green shoots of economic springtime, however, are easily forgotten in A-list St Barths with over a billion dollars’ worth of the world’s greatest yachts chasing each other around the capricious rock-strewn coast in a gorgeous symphony of excess. The names and the superlatives are all there. The biggest, Maltese Falcon & Mirabella V. The fastest, Leopard. The most beautiful, J’s Ranger & Hanuman. The most elegant, Elena. The coolest, P2 & Twizzle. The newest, Christopher. But not me. Sadly this year I’m not there to immortalise it all in charcoal and watercolour. 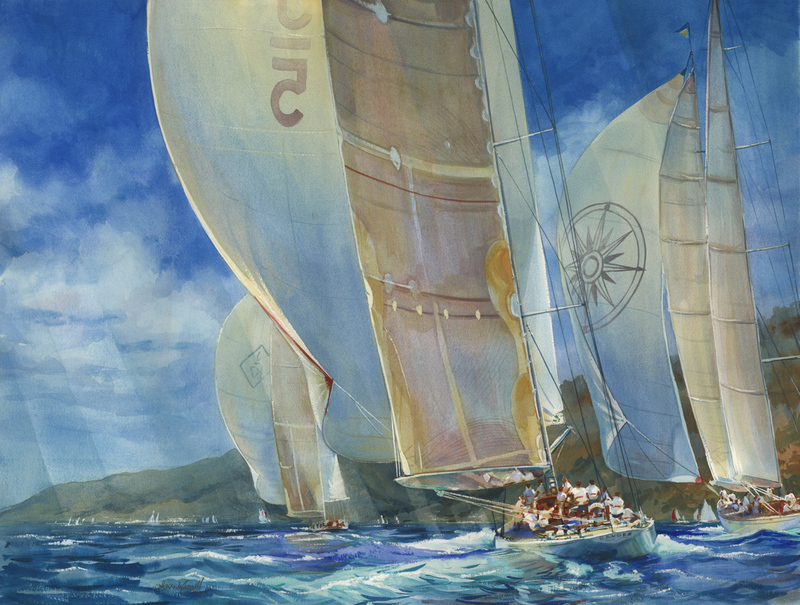 Painting of the Month shows the great J-Class yachts Ranger and Velsheda, with Windrose of Amsterdam leading the field at Antigua. The location’s different but the spirit’s the same. No, I am focusing on architecture, on terra ferma, for now. I am moving into the revered surroundings of GF Watts’ Great Studio the very day the Bucket is won in St Barths. I am embarking on a series of monumental watercolours, superworks the likes of which have never been seen before, breaking my own records in terms of size and impact, I will be unveiling my own symphony of excess later in the year – the biggest, fastest, coolest and newest – watercolours the likes of which the world has never seen. Then I’ll deserve a trip to St Barths next year! Sublime scenery and comfort; cruising across France in the Bentley headed for the Monaco Yacht Show, what could be better than that? It’s what we’ve grown to love about Cornwall in August: two days of sea mist, drizzle and sou’westerlies, then reluctant spring sun giving way to resplendent summer for the last days. 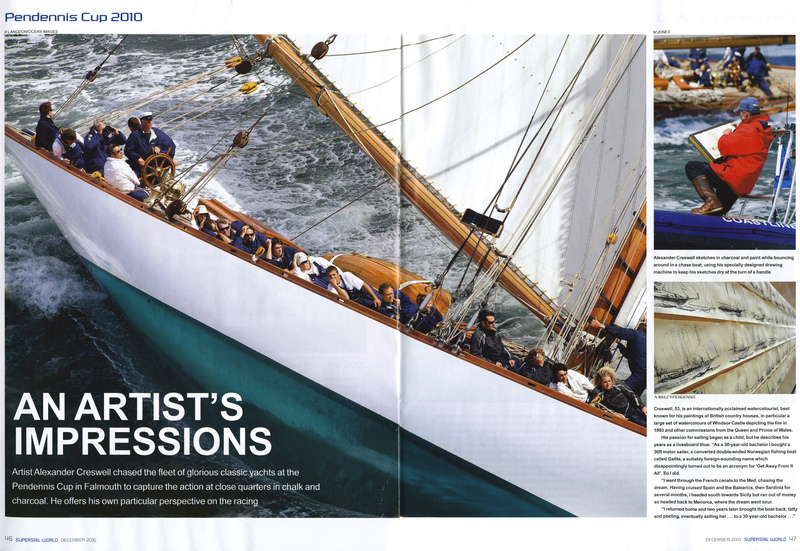 I was here at the Pendennis Cup for five days of non-stop drawing of beautiful yachts in Falmouth Bay. The azure Mediterranean and Caribbean are wonderful, of course, but in Cornwall we were to have the broadest variety of conditions and the water was a symphony of greens, greys and blues. I was chasing in a RIB and, whatever the weather, drawing to record the action, the spirit and the sensation of classic yacht racing – power and grace right up close, hearing the grunting of the easing sheets, the shouts of the crew, the roar of displaced water as they powered though the seas. Racing started on the first day with a flurry of protest flags as the Big Class jostled across the start line, spars almost touching. The murky grey gloom was alleviated by Adela’s crew shirts making dots of bright red in the gloom. At the top mark her ‘Big Red’ kite was hoisted for the downwind run and she was soon lost in the mist as Mariette and Mariquita rounded behind. Skippers and tacticians were on their mettle laying for Gull Rock as the turning mark, a jagged reminder of the hostility of this coast. What a way to begin a regatta! Adela rounded first in the mist, then the ghostly silhouette of Mariquita appeared, slicing the water in streaks of white and indigo. She broke the eerie silence with cries of heave! and ho! as the sheets were hardened in without the benefit of winches to put her on the windward tack, followed by Mariette and Velacarina. Danger was not far away and the Sparkman & Stephens ketch Tomahawk had broken her mast at the first mark and was taken for repair into Pendennis Shipyard. She would reappear before the end of the week but for now her classmate Pinuccia, a local classic owned by the Tresanton Hotel, was on her own. I had succeeded in making a series of wet, splashy sketches in smudgy charcoal for sky, water and sail alike with white chalk in streaks for the cresting seas and foaming bow-waves. My drawing machine provided me with a ten-metre roll of dry paper, tinted to allow the use of white chalk. So far I had needed only grey.